Jackson, who directs APPC’s FactCheck.org website, and Jamieson, APPC’s director, teamed up with Pulitzer Prize-winning cartoonist Signe Wilkinson of the Philadelphia Daily News to detail how spin has worked successfully in selling everything from war and taxes to emu oil and “tall” coffees. During the Radio Times interview, Jackson and Jamieson criticized the news media for failing to serve as neutral arbiters of accuracy, to help the American public cut through the deception. “The role of the media is to be a custodian of the facts,” said Jamieson. 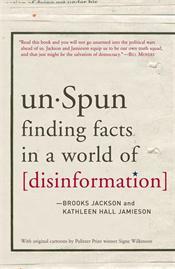 Instead, said Jackson, the media often praises candidates for their success at spinning the truth, much like they’d praise a pitcher for throwing knuckleballs past a batter. A unique feature of unSpun is a companion website that allows the authors to update the book online. For example, after unSpun went to press, new data on the homeless population became available and is now posted on the site, http://unspun.factcheck.org/. Jamieson calls this feature “a pioneer use of the internet” that will enable researchers and authors to keep print publications current, as well as to provide supplemental data. UnSpun’s source notes also are included on the website.